This page features all of the 3 digit Victorian heritage plates from 500 to 749 which have been listed on the Heritage Number Plate Spotting Facebook page. This plate sold for $57,500 at the 2014 Shannons Melbourne Autumn Classic Auction. This plate sold for $27,000 at the 2005 Shannons Melbourne Winter Classic Auction. This plate sold for $40,500 at the 2013 Shannons Melbourne Spring Classic Auction. This plate sold for $43,000 at the 2012 Shannons Melbourne Autumn Classic Auction. It sold again for $44,000 at the 2013 Shannons Melbourne Late Summer Classic Auction. This plate was previously posted on a Maserati (2 June 2014). Click here for the photo. This plate was passed in at the 2012 Shannons Melbourne Winter Classic Auction. This plate sold for $41,000 at the 2015 Shannons Melbourne Winter Classic Auction. This plate sold for $33,500 at the 2005 Shannons Melbourne Winter Classic Auction. This plate sold for $38,000 at the 2013 Shannons Melbourne Winter Classic Auction. This plate sold for $24,500 at the 2005 Shannons Summer Auction. This plate sold for $75,000 at the 2008 Shannons Melbourne Winter Classic Auction. This plate sold for $43,000 at the 2011 Shannons Melbourne Summer Classic Auction. Follow this link for more Ferrari model number heritage plates. Click here for more ‘repeating triple’ Victorian heritage plates. This plate sold for $40,000 at the 2009 Melbourne International Motorshow Auction. Previously posted on a Porsche Cayenne Turbo (August 2014). 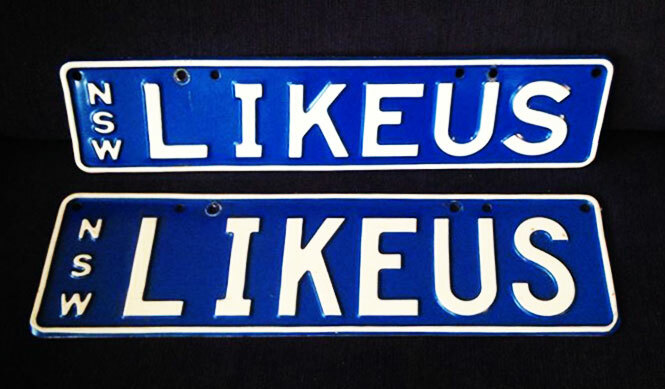 This plate sold for $72,000 at the 2009 Shannons Melbourne Summer Classic Vehicle Auction. This plate sold for $45,500 at the 2013 Shannons Melbourne Late Summer Classic Auction. Previously posted on a Porsche Cayenne (June 2014). This plate sold for $72,000 at The Premium Plate Auction 2008. This plate sold for $43,500 at the 2010 Shannons Motorclassica Collector Vehicle Auction. This plate sold for $47,500 at the 2011 Australian International Motor Show Auction. Follow the link for more photos and information: Vic 577. This plate sold for $41,000 at ‘The Premium Plate Auction 2011‘. This plate has previously been posted on a Porsche Panamera (August 2014) and a Bentley Continental GTC (November 2015). The black Aston Martin to the right wears the Vic 57 plate. 599 – Ferrari 599 GTO – 23 September 2015 – More photos and information: Vic 599. This plate sold for $94,000 at the 2010 Shannons Melbourne Classic Auction. Click here for more Ferrari-themed heritage plates on matching cars. This plate sold for $41,000 at the 2009 Melbourne International Motorshow Auction. The plate had previously been posted on a Range Rover Vogue (May 2015). This plate sold for $42,000 at the 2011 Australian International Motor Show Auction. 606 – Mercedes-Benz CLS Shooting Brake – 10 October 2014 – More photos and information: Vic 606. This plate sold for $61,000 at The Premium Plate Auction 2008. This plate sold for $24,860 at a Bonhams auction. That was a record auction price for a Victorian 3-digit at the time, but unfortunately we don’t know what year it was. Definitely prior to 2005. Although the plate is not very clear in this photo, a VicRoads search confirms 646 is on a silver Bentley convertible. This plate sold for $55,000 at the 2015 Shannons Melbourne Autumn Classic Auction. This plate sold for $52,000 at the 2010 Shannons Melbourne Winter Classic Auction. This plate sold for $38,000 at the 2013 Shannons Melbourne Spring Classic Auction. This plate sold for $44,000 at the 2014 Shannons Melbourne Winter Classic Auction. This was one of 8 plates auctioned late 2005 by Fowles Auction Group – 441, 494, 664, 14832, 22305, 131292, 268862, 280270 – Unfortunately we have no auction sale values. Previously posted on a Ford Ranger (September 2014). This plate was passed in at the 2012 Shannons Melbourne Spring Classic Auction. This plate sold for $106,000 at the 2016 Shannons Melbourne Autumn Classic Auction. This appears to be an old pressed tin plate from before 1983 when the auction style plates were issued. This plate sold for $43,500 at the 2015 Shannons Melbourne Winter Classic Auction. This plate sold for $40,000 at the 2008 Shannons Melbourne Summer Classic Auction. Previously posted on a McLaren 21C (September 2014). This plate sold for $41,000 at The Premium Plate Auction 2011. This plate has previously been photographed on a silver Mercedes SL. This plate sold for $47,600 at the 2010 Shannons Motorclassica Collector Vehicle Auction. This plate sold for $60,000 at the 2015 Shannons Melbourne Summer Classic Auction. Previously posted on an earlier model Mercedes C63 AMG (March 2015). This plate sold for $48,000 at the 2015 Shannons Melbourne Late Summer Classic Auction. There are plenty more plates where these came from! Click here to view plates 750 – 999.